Some weeks ago Luca and I spent a weekend in the Central Massif in France, a plateau the size of Castile and Leon, with an average height of around 600m. On Friday we went to Chaudes-Aigues where we wanted to spend the saturday in a spa. The village, in the region of Auvergne, has less than 1,000 inhabitants, a couple of hotels and restaurants and its famous for its hot springs. With over 30 different springs starting from 45ºC to 82ºC, the latter is supposed to be one of the hottest ones in Europe (if not the hottest as proudly announced in the signpost close to it). 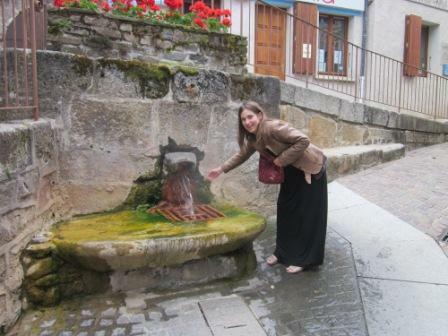 Luca by the 82ºC hot spring in Chaudes-Aigues (arguably the hottest in Europe… the spring as well). Another curious thing of Chaudes-Aigues is a network of hot water going through private houses built back in the year 1,332, which is still working today though only in those original houses. 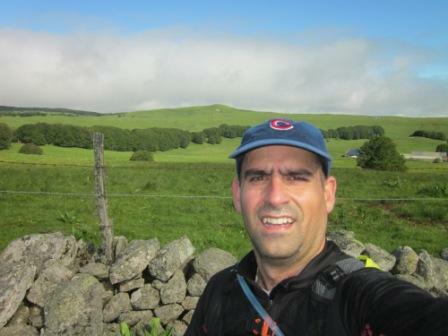 On Sunday morning, we woke quite early to cover the distance to Nasbinals, another little commune in the region of Aubrac where I wanted to run a ~18km trail. Start line of the trail. I started the trail in the back of the pack so I took the first kilometres without stress trying to run with the crowd and only overtaking other runners where possible and moderately easy. In that way I could enjoy at some points the views offered by the circuit of the trail, which at points was through closed forests but at some others was through open countryside. I was running with the water bag and carried some vanilla-flavoured energetic gels, so I did not have any problems with supplies, I didn’t need to use those provided by the organization. One good point of the trail is that the route was very well marked, however, the measuring of the distance wasn’t. The trail was supposed to be 18 kilometres long, and when my GPS-watch indicated 17.75km I saw a signpost saying “Arrivée 2 km”. In the end I measured 19.60 km, but I guess the organization knows this, as in their own web, when showing the altitude profile, the distance they have measured is clearly over 19km. 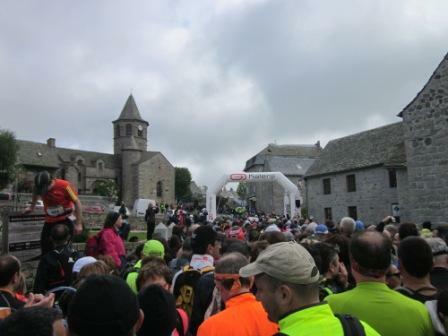 Profile of the race “Trail des Capucins” (over 19km instead of the announced 18km). It is not such a big issue, though you may have been managing your strength resources to have a last good kilometre and instead you find out that there are still 2 more to go! It would be as easy as to announce the trail as a 19km or 19.6km instead of 18km. In the end it took me over 2 hours and 12 minutes, and ended the 255th out of 810 runners. A good run for a Sunday morning.